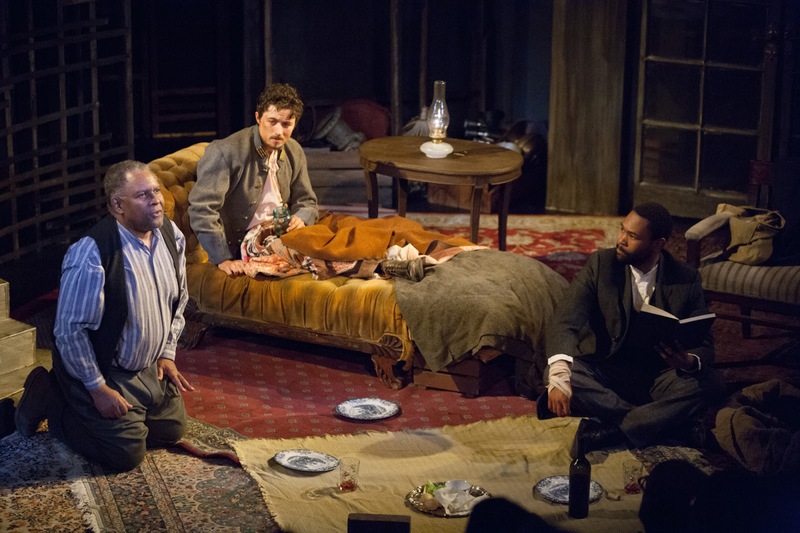 The Whipping Man is a quiet little surprise of a theatrical production, and that is a most welcome thing. I missed Penumbra Theatre’s regional premiere of Matthew Lopez’s play eight years ago but it’s easy to see how it became one of the most produced plays in regional theaters around the country in recent years. And it’s not just because it’s a single set, three-person show that makes it logistically easier for a theater to produce. They don’t really write plays like The Whipping Man much anymore, which makes me appreciate it even more fully. The Whipping Man is a play that just allows three richly drawn characters to exist in the same space together in varying combinations, and over the course of the story, these three people just keep revealing new things about themselves, one layer at a time. The revelations keep coming right up into the very closing minutes of the play. And it’s not filled with a lot of melodrama or wailing and bombast. These characters feel things very deeply, and have a lot of cause for grievance, but they don’t get what they want with a lot of yelling and screaming. It’s the quiet moments in The Whipping Man that are the most telling, including that final, very loaded moment when the lights begin to the fade at the end of the play. A moment filled with a strange kind of hope. A hope we desperately need right now. Put a story like this in the hands of a talented director - Sally Wingert - and three skilled actors - Warren C. Bowles, JuCoby Johnson, and Riley O’Toole - as the Minnesota Jewish Theatre does, and you’ve got a powerful piece of theater. The Whipping Man takes place at the end of the Civil War (I know, I know, I had the same knee-jerk “Oh man, I’m not sure I want to go there right now” response, but go there, you get an enormous payoff). A young Jewish Confederate soldier (yes, apparently we had those, I feel slightly remiss in my education) Caleb DeLeon (O’Toole) returns to his family estate to find it looted and in ruins. But an old faithful family servant, Simon (Bowles), now a free man rather than a slave thanks to President Lincoln, still stands guard over the house. A younger freed slave who is Caleb’s age named John (Johnson) also soon makes an appearance. John has been helping himself to the contents of unguarded neighboring estates and now returns to the DeLeon place, which was also once his home. Though absent, Caleb’s father, and Simon’s wife and daughter, all cast long shadows over the memory and relationships of the three men taking refuge in the ravaged homestead. Caleb has been wounded in one of the Civll War’s final battles and it’s up to Simon and John, who can no longer be commanded, but only asked, to help keep Caleb alive. All these men have something to fear, and all these men have something to hide. But at the same time they all have something to hope for. And that’s what ultimately makes The Whipping Man such a satisfying experience. To say too much more would give away some of the many interesting surprises and turns in the plot and character revelations, and in the case of The Whipping Man, it’s really best to go in blind and go on the journey. Honestly, I heard “beloved Twin Cities actress Sally Wingert makes her directorial debut” and I didn’t even care what the play was. I wanted to see it. The three actors involved just sweetened the deal.